Let’s kick off the winter edition of BAMF Style’s semi-annual (or is that bi-annual) Car Week where I take an additional look at what these well-dressed characters are driving. 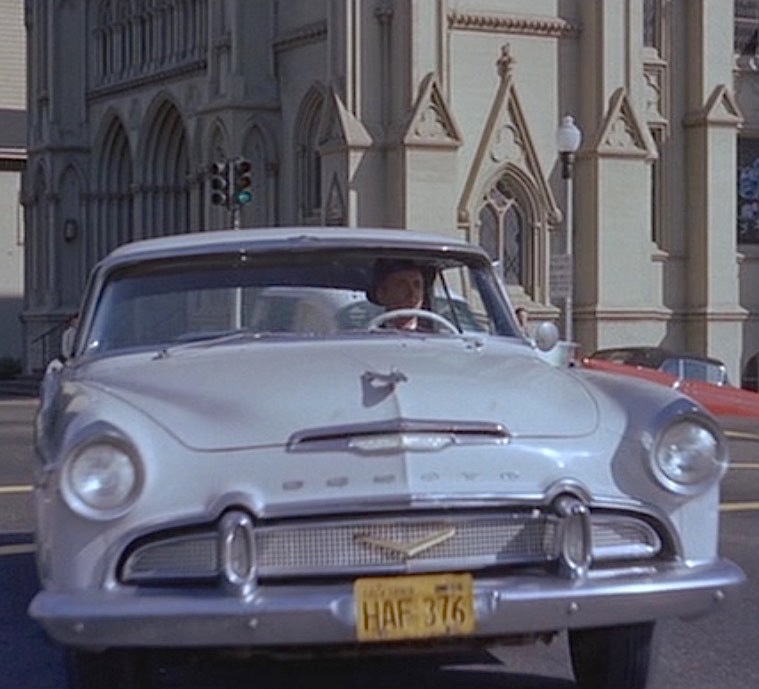 Vertigo, Alfred Hitchcock’s noir-esque 1958 thriller and the last of his four collaborations with James Stewart, finds the actor behind the wheel of a white DeSoto coupe as he follows Kim Novak’s character around San Francisco from her Nob Hill apartment and the Podesta Baldocchi flower shop to Mission Dolores and their fateful meeting at Fort Point on the southern end of the Golden Gate Bridge. Midge: It’s a brassiere! You know about those things, you’re a big boy now. Scottie: I’ve never run across one like that. Midge: It’s brand new. Revolutionary up-lift: no shoulder straps, no back straps, but it does everything a brassiere should do… works on the principle of the cantilevered bridge. Midge: An aircraft engineer down the peninsula designed it. He worked it out in his spare time. Scottie: Kind of a hobby… a do-it-yourself kind of thing! 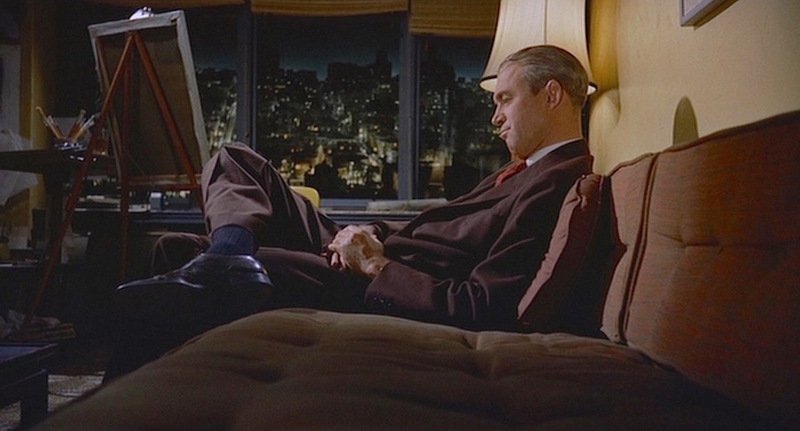 Like many men in mid-century America, Scottie’s wardrobe consists of a limited but versatile selection of business suits in varying shades of blue, gray, and brown. 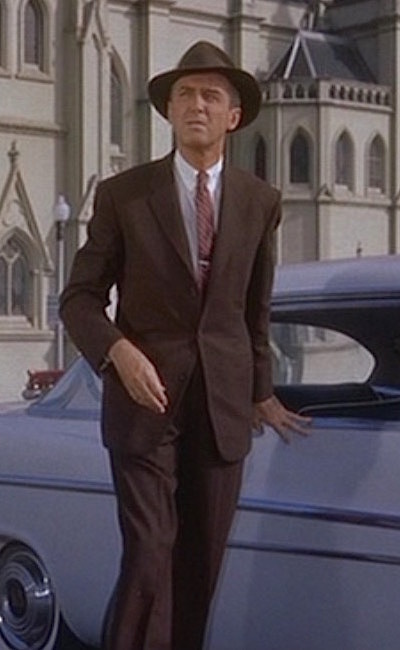 The suits are all generally cut the same – single-breasted, three-button jackets with notch lapels and pleated trousers with turn-ups – with variations in the suiting and style: three are flannel while two are serge, three have ventless jackets while the other two have short vents, and two of the suits have sporty patch pocket jackets as well. 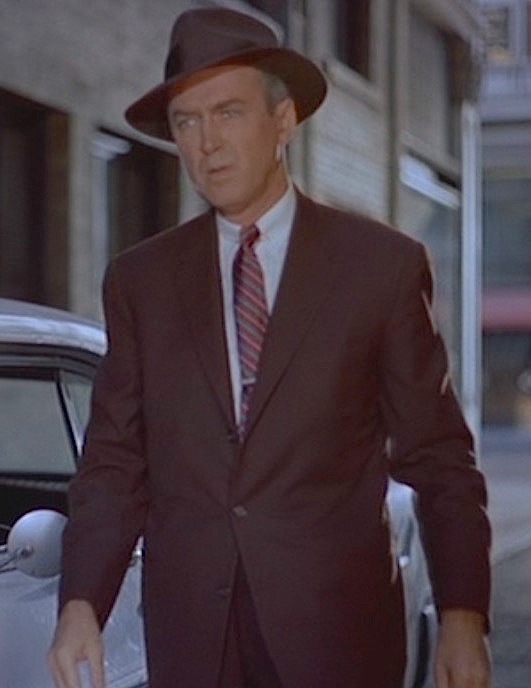 The suit that Scottie wears for his introductory scene with Midge, and much of his subsequent investigation following Madeleine around town, is a brown serge that closely matches his hat. Scottie’s tie bar gleams in the San Francisco sun. 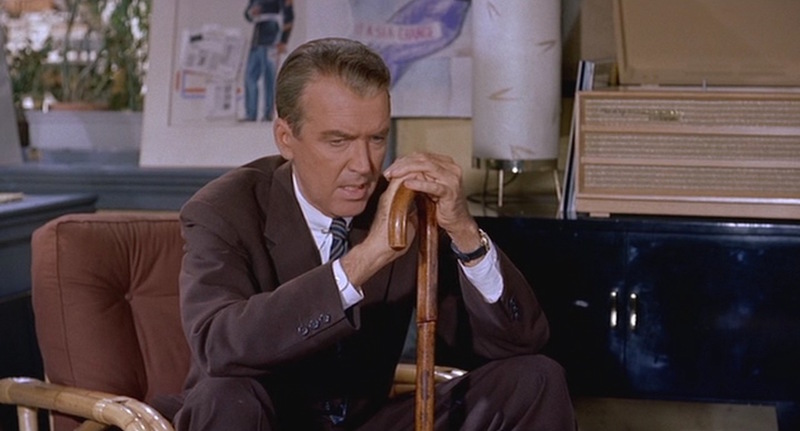 With his tall, lean frame, James Stewart benefits from the visual balance of a three-button tailored jacket as opposed to a two-button jacket. This brown serge suit jacket is no exception. The ventless jacket also has a welted breast pocket, straight jetted hip pockets, and three-button cuffs. 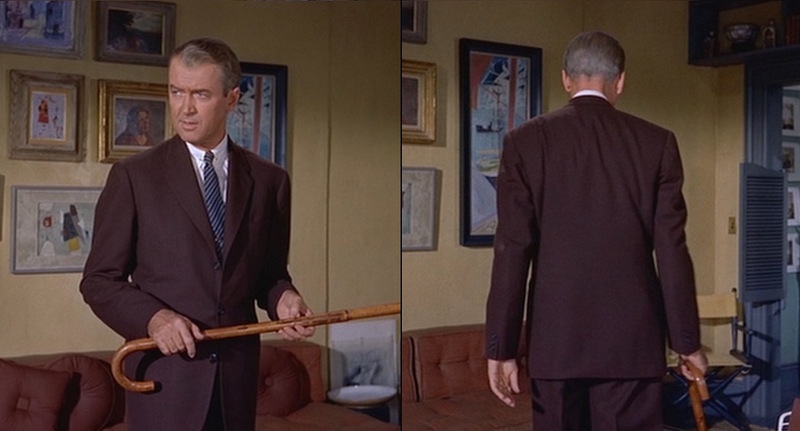 Scottie shows off his abilities with – and without – his cane. Scottie’s suit has matching trousers with a proportionally long rise that harmonizes with the suit jacket and Stewart’s 6’2″ height. The single reverse-pleated trousers have side pockets, a back pocket on the left side for Scottie’s wallet, and turn-ups (cuffs) on the bottoms. He wears a dark brown leather belt that coordinates with his cordovan leather footwear and fastens through a small, squared gold single-prong buckle. 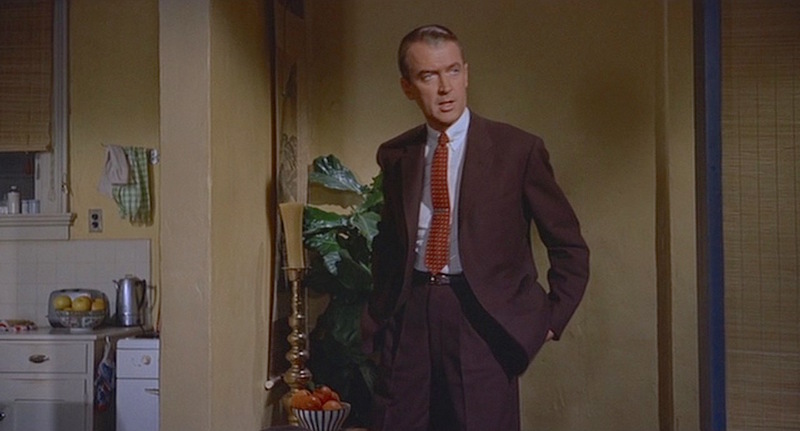 While Scottie creatively rotates his suits, ties, belts, and accessories, one part of his wardrobe that never deviates are his clean white cotton poplin shirts with James Stewart’s signature two-button barrel cuff that visually balance the actor’s long arms. Note the cuff button close to the edge of Stewart’s sleeve. There is a second button further up his arm, concealed by the suit jacket sleeve. Other than a brief sequence when he pays less attention to his wardrobe, Scottie always augments his shirts and ties with a collar pin and a tie bar. The safety pin-style collar bar pins both of his collar leaves under the tie knot for a tidy look, while he wears the tie clip just above the buttoning point of his jacket, shining through even with the jacket fastened. Both the collar bar and his tie clip are gold when he wears this brown serge suit. 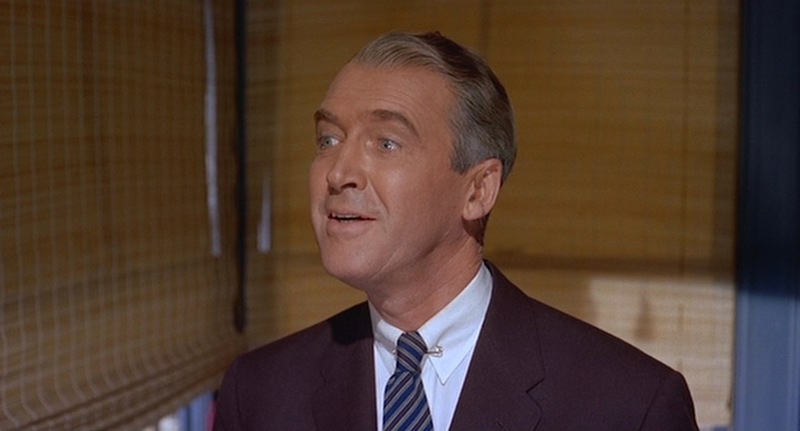 It’s interesting to consider Scottie’s practice of wearing both a collar and tie bar when taking a closer look at his actual neckwear. While most of his ties are patterned or striped in multiple colors, the patterns themselves are always orderly and never abstract; the stripes follow a certain repeating sequence and the grid-like patterns of his other ties could doubly serve as an early map of Philadelphia. This is clearly a man who is interested in dressing well but hesitates risking something looking out of order. Scottie’s first tie is striped in multiple shades of blue, including a periwinkle, royal blue, and dark navy, all split with hairline stripes and following the “uphill” direction of British regimental ties. Interestingly, this is the same tie he wears with his brown birdseye tweed sport jacket when he and Madeleine share a fateful day at Mission San Juan Batista. The many moods of Scottie Ferguson, part 1: delighted. 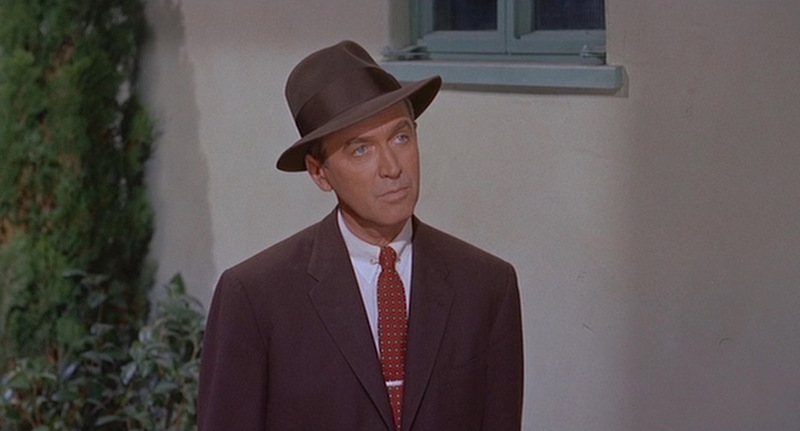 A few scenes later, Scottie is wearing the same tie as he follows Madeleine around the city. He wears a silk tie “downhill”-striped in red and gray, though the gray alternates between thick sets of duo-toned stripes and a single mid-gray stripe. He later wears this same tie with his royal blue serge suit. For a day that finds Scottie finally face-to-face and interacting with Madeleine, he wears this suit and a bright red foulard tie patterned in a crimson geometric grid with a yellow dot at the center of each grid cell. 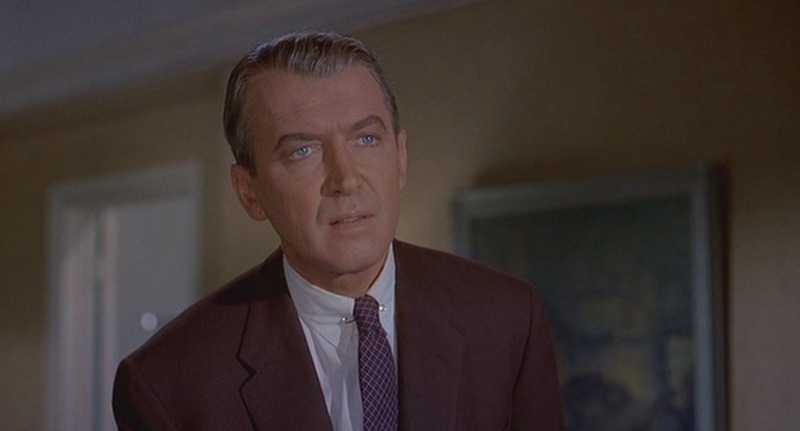 Scottie takes a break from bothering with collar pins or tie bars after the incident at Mission San Juan Batista, still wearing ties with his suits but sometimes not even buttoning the top button. 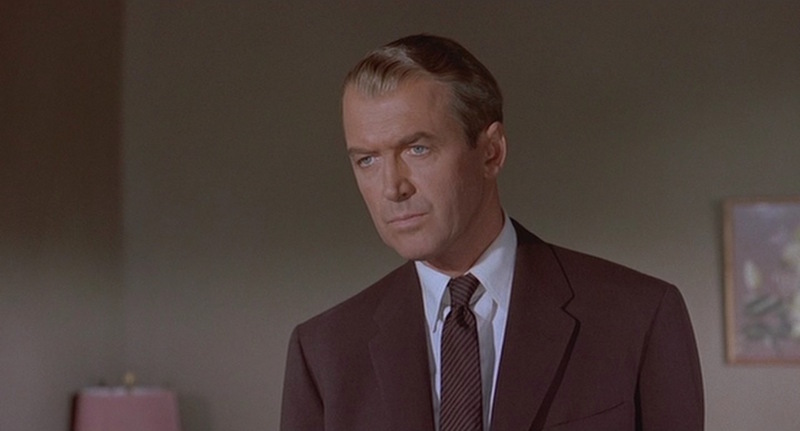 This sequence of Vertigo also features the simplest tie that Scottie wears with his brown suit, “uphill”-striped in two shades of brown. Each stripe is the same narrow width. Scottie’s fifth and final tie with this outfit is a mini-plaid pattern with white and red stripes cross-checked on a navy ground. With this tie, he is back to wearing his standard collar pins and tie bars. Never one to be caught outside without his hat, Scottie wears a chocolate brown felt fedora with a wide brown grosgrain band and a 2.25″-wide self-bound brim reminiscent of “the Cavanagh edge” used by some of the best hatmakers after Cavanagh’s first patent expired in 1931. 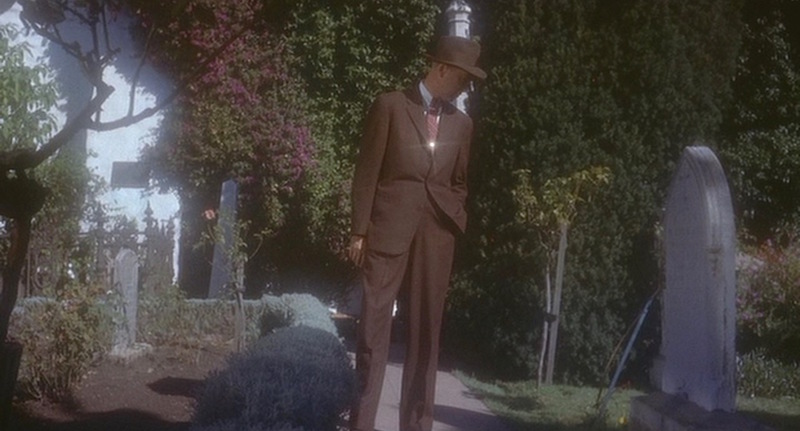 It appears to be the same hat worn by Stewart in many of his films across the 1950s, including The Glenn Miller Story (1954), The Man Who Knew Too Much (1956), Bell, Book, and Candle (1958), and even possibly Harvey (1950). Stewart granted an interview to The Arizona Republic in 1972 that mentions he was still wearing the same hat decades later, albeit with some TLC to keep it together. Discussion at the online forum The Fedora Lounge has suggested that Churchill Ltd. made Jimmy Stewart’s Vertigo hat and thus was the maker of his tried-and-true brown fedora throughout his 1950s career, though the forum also suggests Borsalino, Cavanagh, Dobbs Fifth Avenue, and Stetson among the possible brands that the actor preferred. 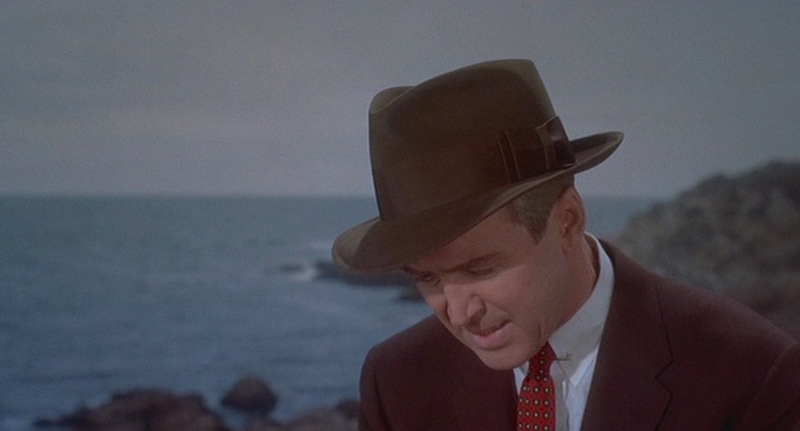 Jimmy Stewart’s well-traveled Churchill hat appears throughout Vertigo. Scottie wears his cordovan wingtip oxford brogues with their five-eyelet closed lacing. 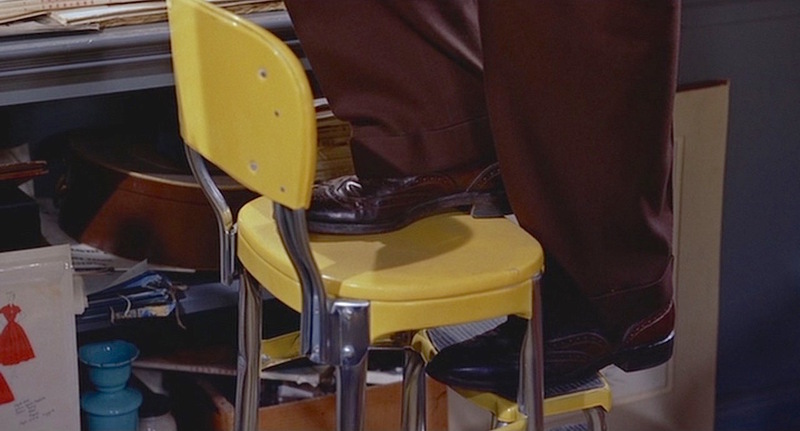 The shoes are just a shade warmer than his brown suit. Scottie’s suit trousers have a full break that covers much of his shoes. Scottie ignores the common menswear practice of matching one’s hosiery to his trousers – or at least his shoes – and wears a pair of dark navy ribbed socks. Taking it easy on Midge’s mid-century couch. Despite the many devices keeping his tie straight and in place, Scottie is no-frills about jewelry or accessories, wearing only a plain gold dress watch on a black leather strap. Scottie Ferguson may be a more old-fashioned type of detective, but his set of wheels are nothing short of the latest in fifties automotive fashion, driving around the city in a 1956 DeSoto Firedome Sportsman two-door hardtop coupe in plain white, through the paint takes an icy blue cast under the vivid California sky. Scottie Ferguson pulls up in his white DeSoto. DeSoto heralded its new 1955 lineup by co-opting Cole Porter’s lyrics, with the composer’s permission, of course. As the race for American automotive supremacy continued through the decade, the new DeSoto models were unveiled with a redesign consistent with Chrysler designer Virgil Exner’s “Forward Look” for the fifties. The redesign – as well as the introduction of a four-door hardtop in ’56 – proved fortuitous for the marque, which saw increased sales through the middle of the 1950s. Unlike the more exclusive Fireflite and the high-performance Adventurer, the base model Firedome was applied to a wide range of DeSoto body styles from four-door sedans and station wagons to two-door convertibles and coupes. 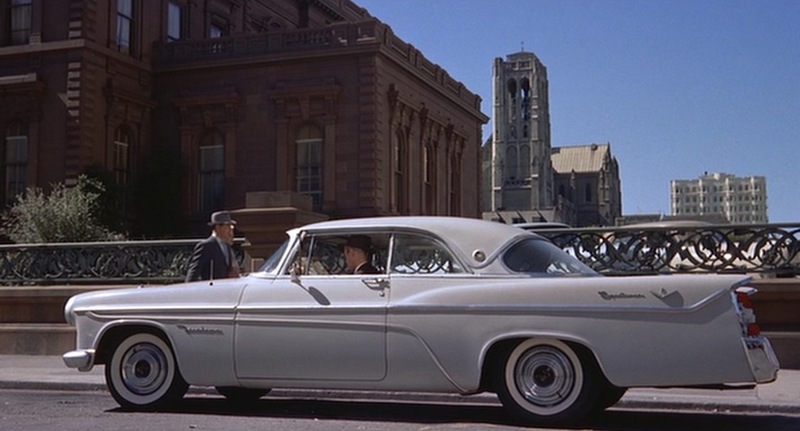 The “Sportsman” trim was available for the four-door sedan and two-door hardtop coupe, the latter of which carried a $2,783 factory price and was driven by Jimmy Stewart through the hilly streets of San Francisco in Vertigo. After DeSoto’s rapid rebranding from top-of-the-line to least expensive, the Firedome found a happy medium as a mid-range offering for its final years of production before it was discontinued for the 1960 model year. DeSoto itself wouldn’t last much longer, barely surviving into the sixties as sales rapidly decreased. Chrysler officially dropped the DeSoto division from its lineup on November 30, 1960, delivering it to the same ignominious fate as once venerated marques as Nash, Packard, and Studebaker that were unable to survive the fierce competition and economic downturn faced by car manufacturers during the “fabulous fifties”. 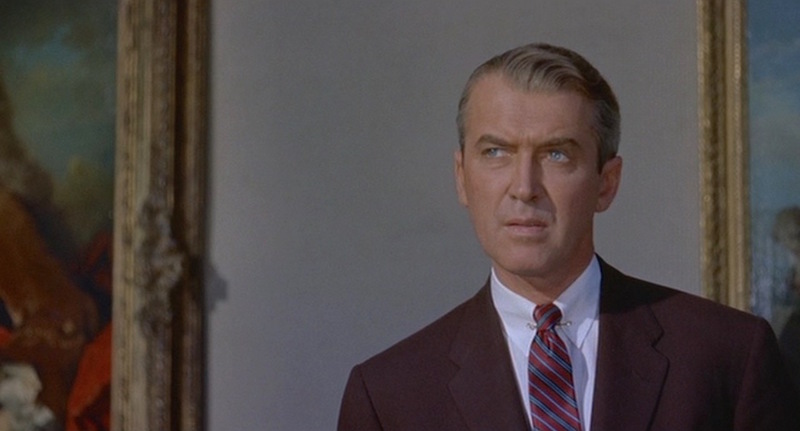 James Stewart brought much of his own simple but stylish aesthetic to his roles, including the character of John “Scottie” Ferguson in Vertigo with his earthy, conservative suits and timeless hats.